Earlier this week, JT mentioned something to me about going to watch him jump rope in gym class. His school had been a part of a campaign to raise money for the American Heart Association through asking for donations and jumping rope. He has been really into this, so I told him I would try to make it up to his school. "Mine was yesterday," Lucy informed me while JT was asking me to come to his day in the gym. "Sorry, I didn't get to yours," I told her. She shrugged, it didn't seem that important to her. Yesterday was JT's jump rope extravaganza. For a minute, instead of going I thought about returning all the emails I needed to return or pitching more people to be sponsors for Listen To Your Mother or going for a run to clear my head. I thought it's just jumping rope, it's not a big deal. But at the last minute I decide to go, so I dragged Wade and we made our way to the elementary school gym to watch JT. It turned out to be a pretty great decision. JT was so happy to see us. 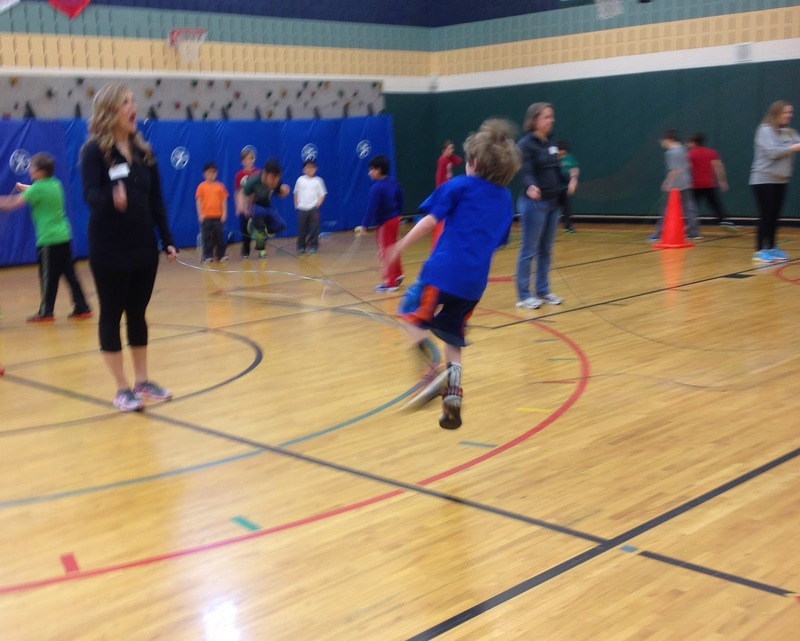 The entire third grade was jumping rope all over the gym. They were laughing and having fun and being kids. It was great. Just when I thought the event was over, the gym teacher said there was a competition and he selected eight kids to compete in front of everyone. JT was one of those eight. I could tell he was nervous, he takes all competition very seriously. All the kids were cheering on their friends. It was so nice to hear the kids cheering JT's name. You see, he's the kind of kid that thrives on those cheers, needs those cheers. His love language is affirmation. He is a confident, certain kid when it comes to sports. He is uncertain and showing major signs of being insecure when it comes to school. And he worries about a lot. Being in the top eight in the jump rope competition was meaningful to him. Being in the top four and then the top two was exciting for him. Being the winner and having all of his third-grade buddies cheer him on and high-five him? Oh man, that kind of affirmation will last a long time. Watching him have his moment and knowing that it meant so much to him made my heart burst open with love. Then I thought about how I almost missed this because of emails or a run. My god! What was wrong with me? But I didn't dwell on that thought because there's no point in feeling guilty. Instead, I just felt grateful that I got to see that moment. There will be moments I will miss, and many I already have missed. There will be times when one of my four kids needs me to show up to more things. There will be times when they want me to and I can't. There will be times...and it will all be okay. No guilt trips here, just gratitude. I am grateful for nice kids cheering my kid on. I am grateful for gym teachers that put so much energy into their jobs. 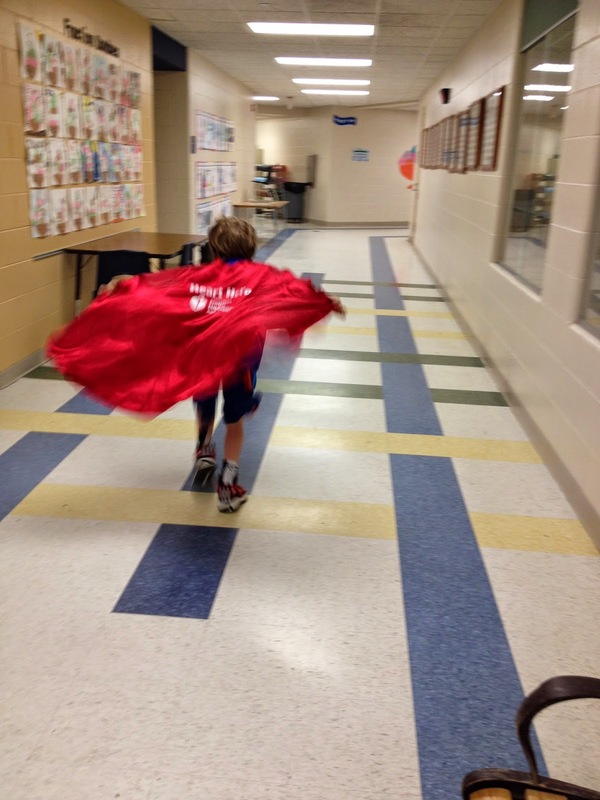 I am grateful that I got to see JT beam with pride as he wore the winning cape. I know those things for sure this week. I also know that all competitions should give away capes as the prize. I mean, right? I am obsessed with Empire. I saw all the buzz about the show, but didn't start watching it until this past week and I looooooove it. It is a mash-up of Dallas and Fame. It is a soap-lovers dream. 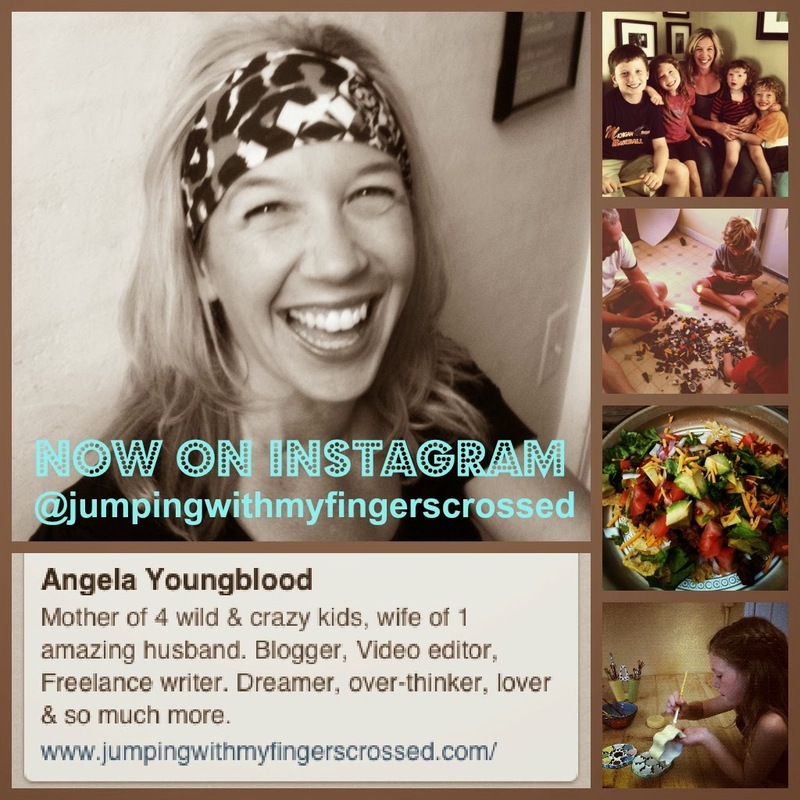 I am trying to get everyone, everywhere to dance in their kitchen. 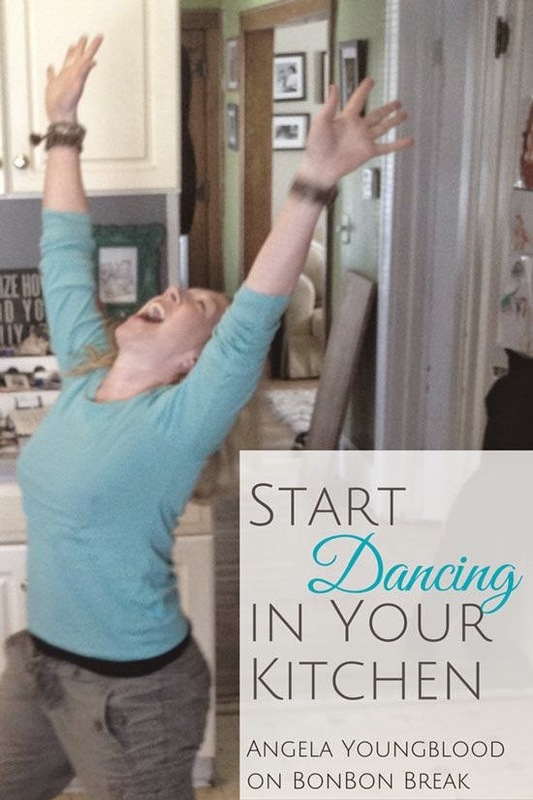 I got a chance to promote my dream and talk about why I dance in my kitchen on Bon Bon Break. Check it out. Wade is registered for kindergarten in the fall. Whaaaaat? I can't even understand how that happened so fast. There are four weeks until Listen To Your Mother Metro Detroit--it's on April 26, at 3 p.m. If you live in, near, around, within a short drive or plan ride away from Detroit, you should come to the show. Click here for details. Click here to just go ahead and buy yourself some tickets! Here's a video about last year's show. Getting another dog wasn't a horrible idea. We love Cosi and Rufus. What do YOU know for sure this week? Leave all your knowledge in the comments here or over on my Facebook page. Every contest should have a cape for a prize - YES! How awesome is that? So glad you got to see what was such a big moment for him. Go JT! I was super selfish with my time when Rachel and Claire were in kinder. Since that meant Zoe got to go to preschool, it was the first time in 5 and a half years that I had ever had some REAL time to myself. Looking back I did regret not volunteering as much at their school, so this year I'm rectifying that. Yay JT! And yay you!